If you want to surf the internet anonymously and more securely, then don’t miss this Giveaway!!. Many people are using VPN services for access blocked sites in your country or office. Also in addition to providing an extra layer of security in online and privacy through encryption and security procedures. VPN connection will create a secure, encrypted tunnel between your computer and the VPN servers. All your Internet browsing will pass via VPN servers using the encrypted tunnel providing security. 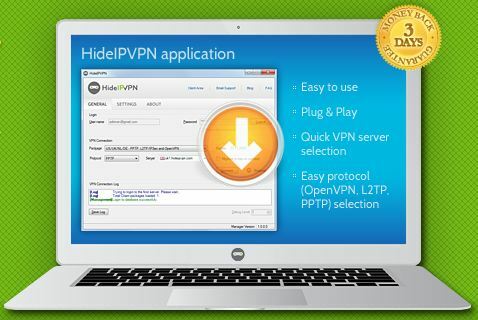 HideIPVPN is a VPN service that allows user’s computer to create a virtual circuit (tunnel) link to remote host, so that all traffic to Internet is routed through HideIPVPN’s servers in US or UK. HideIP VPN also provides advantage such as securing Internet connection when using open Wi-Fi hotspot wireless access to go online, bypass ISP traffic shaping as VPN connection is encrypted and compressed. We are thankful to HideIPVPN for sponsoring the giveaway of 15 Free VPN Accounts for our readers. 2. Leave a comment with proper Email ID on this post with the mentioning the method you have followed in step 1.
my email: lgxlg[at]yahoo.com , thanks! I hope to break through the G-F-W ,and surf the real Internet. anthonyae@gmail:disqus .comIt would help me a lot. May be odds be in my favor this time. →better to light candles than to curse darkness! thanks! Hi there. I’d really want to thank you for this giveaway. I’ve been using the vpn I won from this blog. Many thanks! You should try supervpn free vpn account. It is very easy to get it, you just need to share their page on some social networks. Also, you can apply for 7 days free trial.